Khobar (also spelled Al-Khobar or al-Khubar; Arabic: الخبر‎) is a city located in the Eastern Province of the Kingdom of Saudi Arabia on the coast of the Persian Gulf. It is one of the largest cities in the Gulf Cooperation Council, with a population of 941,358 as of 2012. 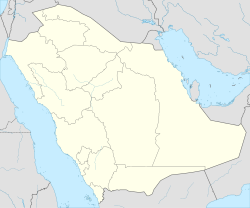 Khobar, Dammam, and Dhahran are part of the Dammam metropolitan area, the 3rd largest metropolitan area in Saudi Arabia with an estimated population of over 4,100,000 as of 2012. All three urban centers are served by the King Fahd International Airport and King Abdul Aziz Port. Together, they are often known as "The Triplet Cities" by many natives and locals. Dammam, Dhahran and Al Khobar are less than 15 km (9.3 mi) apart and form one metropolitan area, the fifth largest in the kingdom and sixth in the Gulf Cooperation Council. Many of Khobar's residents work for Saudi Aramco, the world's largest oil company, Khobar also hosts many regional and international companies. Traditionally, Khobar has also been a city of shopkeepers and merchants, and the city today has many modern malls (such as Dhahran Mall) and boulevards with shops run by international franchises and restaurants. Khobar today has many skyscrapers, with more under construction. In earlier days, Khobar was a small port on the Arab Gulf coast, a fishing village inhabited mainly by Al Dossary tribe members. With the discovery of oil in the 1930s, it was transformed into a commercial and shopping center and an industrial port. The municipality of Khabar was founded in 1942. In modern times, the larger port of Dammam has taken over most commercial shipping activities for the Eastern Province, and oil is exported via the dedicated Saudi Aramco port of Ras Tanura. As a result, Khobar has transformed and extended its water front along the Arab Gulf into a corniche with parks, eateries, and family beaches. In 1996, the Khobar Towers, a US Air Force housing complex, was bombed by militants aided by Iran, killing 19 US servicemen and one Saudi. Khobar is served by King Fahd International Airport northwest of Dammam; the driving distance from the terminal to Khobar city is 50 km (31 mi). Khobar is connected with the major highways in the region including Dhahran-Jubail Highway, Dhahran-Dammam Highway as well as Khobar-Dammam Highway, which links Khobar with Dammam directly and links them both to King Fahd International Airport. Khobar hosts King Fahd Causeway, which links Saudi Arabia to Bahrain. Khobar also features the Water Tower which is situated in a man made peninsula in the khobar water front. The first school in Khobar was established in 1942. Today, Khobar is home to more than 100 public and private educational institutes. The International Indian School, Dammam (CBSE) is the city's and Middle East's largest school, with more than 22000 students. Countries such as Pakistan and Bangladesh also operate their own schools and curriculum. Khobar is also home to several Western-oriented schools such as the International Philippine Schools, British and American Schools, which serve a number of students from various expatriate communities. Examples include Dhahran Ahliya Schools, Manarat International schools, AlFaisaliah Islamic School, Al-Hussan International School Khobar (AHISK), Saad National School, Jubail Academy International School, KFUPM Schools, Pakistan International School, Al-Khobar,Gulf International English School, Khobar French School, International Programs School, British International School Al-Khobar (BISAK), International Schools Group (which has multiple schools across the country), Al-Andalus International School, and International Philippine School in Al Khobar. Khobar is a city with multiple lifestyle centers and shopping malls, The city also has the Corniche (Prince Turki Street) which is lined with several international and local chain restaurants, coffee bars and boutiques of all kinds. The city hosts several shopping centers including: Carrefour, Tamimi Markets, Danube, Hyper Panda, Alissa Souk, Rahmaniah Center,Lulu Hypermarket,Al Gosaibi Center, Khobar Mall, Fanar Mall and Al Rashid Mall. There are also several commercial streets downtown which are populated by local shops, with one being Prince Bandar Street (locally known as Suwaiket Street). Khobar also benefits from being close to the city of Dhahran, which hosts several malls such as Dhahran Mall, Ikea, and Amwaj Center. Besides, the city of Dammam that hosts Dammam cornice, Dammam sea fort and Coral island. Dammam also includes several shopping malls such as Marina mall, Othaim mall and Al-Shatea mall. Khobar Corniche and Azizyh Beach with The half moon in Dhahran are tourist attractions in Khobar. People from the neighboring GCC states and from the rest of the country visit the city to do activities such as fishing, scuba diving and other water sports. Khobar has a desert climate (Köppen climate classification: BWh), with very hot, dry summers and warm wet winters. Its average annual temperature is 33 °C (91 °F) during the day and 22 °C (72 °F) at night. In the coldest month, January, the temperature typically ranges from 12 to 22 °C (54 to 72 °F) during the day to 3 to 18 °C (37 to 64 °F) at night. In the warmest month, June, the typical temperature ranges from 36 to 50 °C (97 to 122 °F) during the day to about 33 °C (91 °F) at night. Generally, the summer / "holiday" season lasts about six months, from May to October. Two months, April and November, are transitional; sometimes the temperature exceeds 48 °C (118 °F), with temperatures ranging from 37–50 °C (99–122 °F) during the day and 24–36 °C (75–97 °F) at night. Large fluctuations in temperature are rare, particularly in the summer months.